It’s 9 am on a lazy Sunday morning…time for a drink! At least, that’s what Cocktail Enthusiast’s Kevin Gray would like us to say this weekend, since Mixology Monday is just around the corner, and the theme is “Morning Drinks.” Provided that you’re wide awake, be sure to check the MxMo website, and stay tuned to Kevin’s site for the roundup post. While the Ramos Gin Fizz is one of the best breakfast/brunch drinks I know of out there, I’ve covered it already. Orange juice, coffee, and/or milk are my morning tipples of choice… boozing it up in the wee hours of the day just isn’t really my thing. Every now and then I’ll feel the urge, though, and on several past occasions I’ve mixed up the simple-yet-delicious Milk Punch. Those occasions being in the summer months, the Milk Punch was served over crushed ice. Seeing as Fall has made its presence known and the golden light of morning is accompanied by a slight chill, I’ve opted for the heated version. To top that off, I’ve included some recent experimental infusions. Stir rum, brandy, and sugar together, then pour into a glass or ceramic mug and fill with hot milk. Grate the nutmeg over the top. Enjoy alongside your coffee, eggs, and bacon, or maybe a cinnamon roll! It should be noted that the Milk Punch has a considerable amount of documentation to go along with it. Ted Haigh, writing in Vintage Spirits & Forgotten Cocktails, notes that it is a New Orleans classic listed in Jerry Thomas’s Bar Guide in 1862. The original contained no vanilla extract, which is commonly added today, but the Virgin Islands rum called for in the recipe probably lent a hint of vanilla to the mixture. Haigh calls for more brandy than rum, while Paul Clarke favors an equal mix of the two; you can also use bourbon to great effect, as Robert Hess demonstrates. For another entertaining MxMo write-up, check out Rumdood’s site. If you’re looking for further inspiration, the folks over at Merchant in Madison, WI make a mean version with Laird’s Applejack and Cruzan Blackstrap. Oh, and one more thing: use whole milk, or at least 2% milk, when making this drink: skim is just to thin and watery. 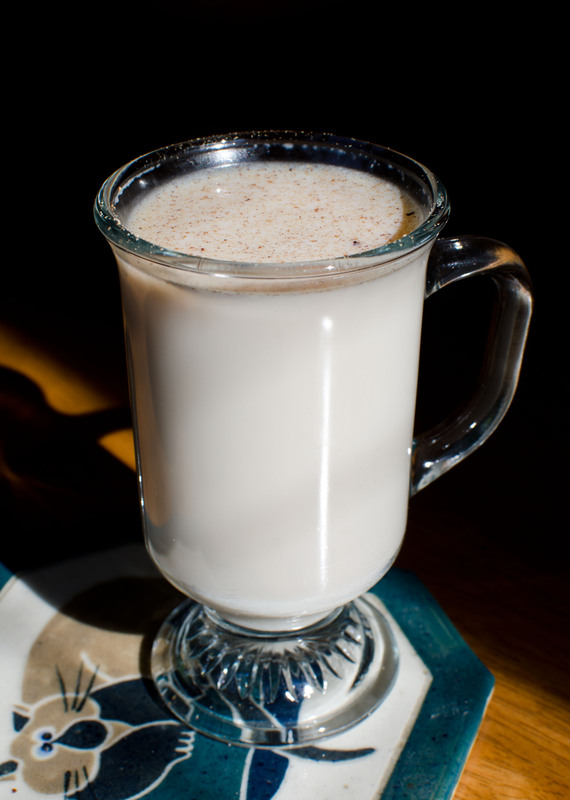 The hot version wins out over any Flip in my book, and offers some serious competition for Eggnog as a holiday drink. Freshly grated nutmeg is also a given, though cinnamon would yield some nice results, as well. 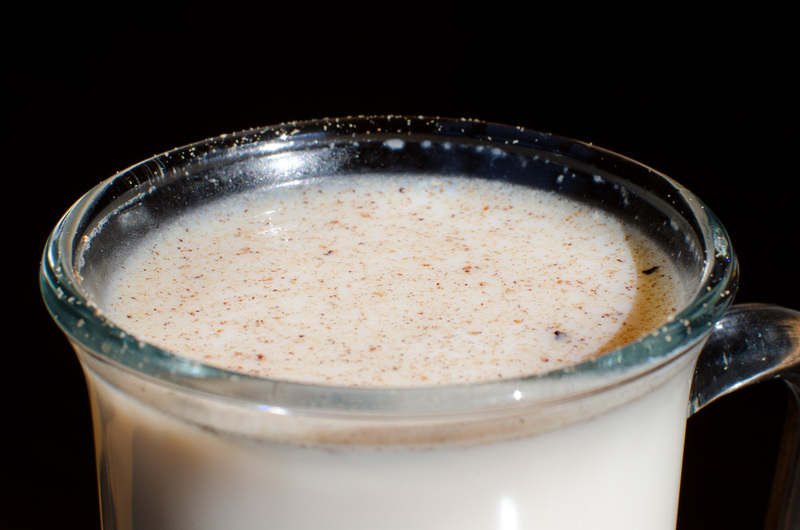 This entry was posted on October 23, 2011 by IJ Lauer in brandy, Rum, Uncategorized, Vanilla Syrup and tagged brandy, hot, milk punch, mixology monday, nutmeg drink, spiced rum.